Here are a couple of videos – 62 years apart. 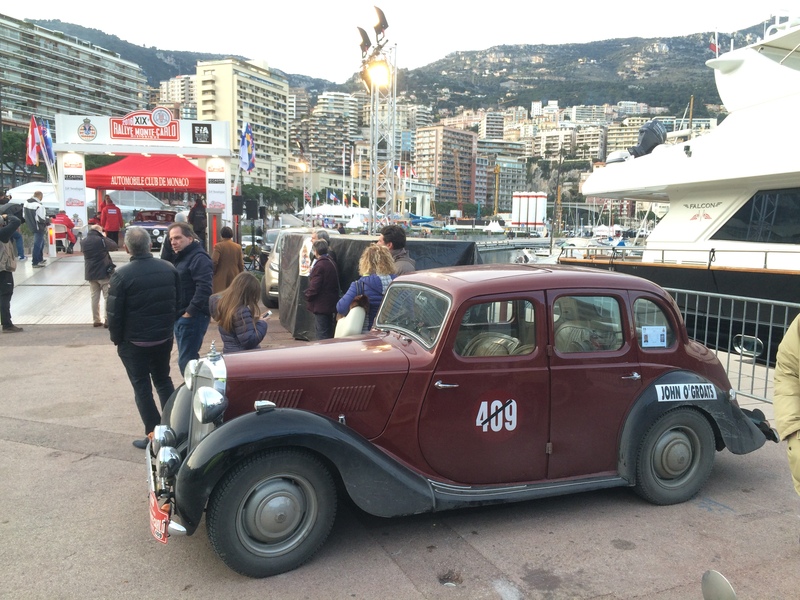 The first shows the arrival at Monaco Harbour of Gregor Grant at the finish of the Monte Carlo Rally in 1954. Little did he know he was soon to be disqualified for missing the final time control. 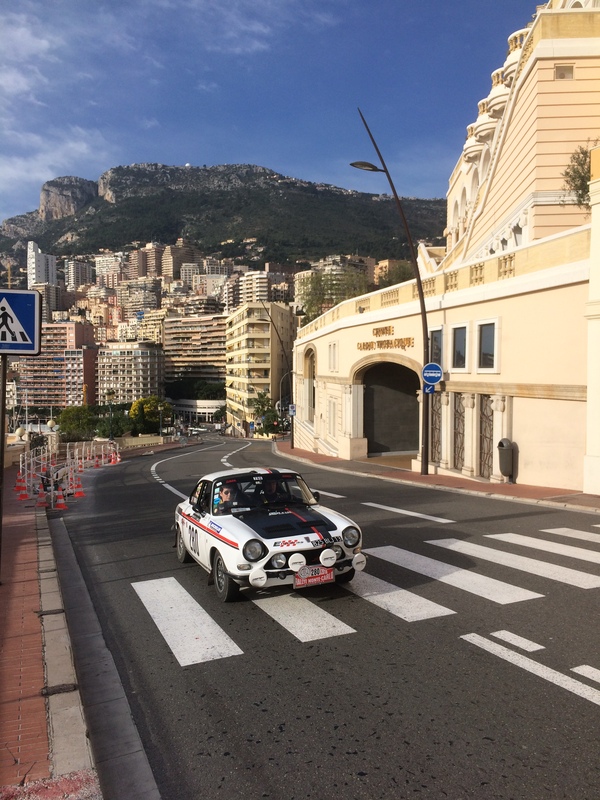 The second video shows my arrival at the same place in the same car at the end of the Rallye Monte Carlo Classique in January 2016. The route from Saint Andres-les-Alpes to Monaco was relatively straightforward and downhill all the way. Within a few hours we reached Nice on the coast where it was sunny and a good 10 degrees warmer than up in the mountains..
As we were so close to Monaco we decided to sprint to the finish by taking the peage from Nice to the principality. What we had not recalled was that the 30 or so miles is for the main part uphill. The strain on the engine pulling the car uphill non stop for 30 minutes in the warm air caused her to overheat. We pulled over some 10 miles from Monaco and let her cool down a bit. 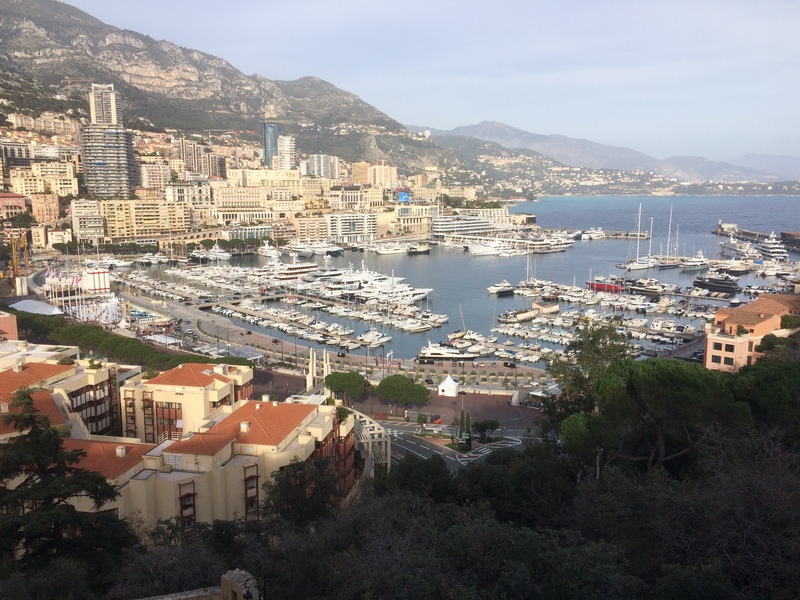 Then very gingerly motored on to La Turbie where we turned off the peage and coasted down several thousand feet to the finish line at Monaco harbour. When we arrived at the finish we found the ACM still setting up. We were the first car in of all the Classiques and indeed all the Historiques too! Here Per can be seen chatting Claude Plasseraud of the ACM who had scrutineered and seen us off from John O’ Groats and who was at the finish to welcome us. The hospitality and efficiency of the ACM were first rate. UMG 662 on the finishing gantry at Monaco Harbour. We are proudly flying the new Caithness flag that had been carried down from John O’ Groats. 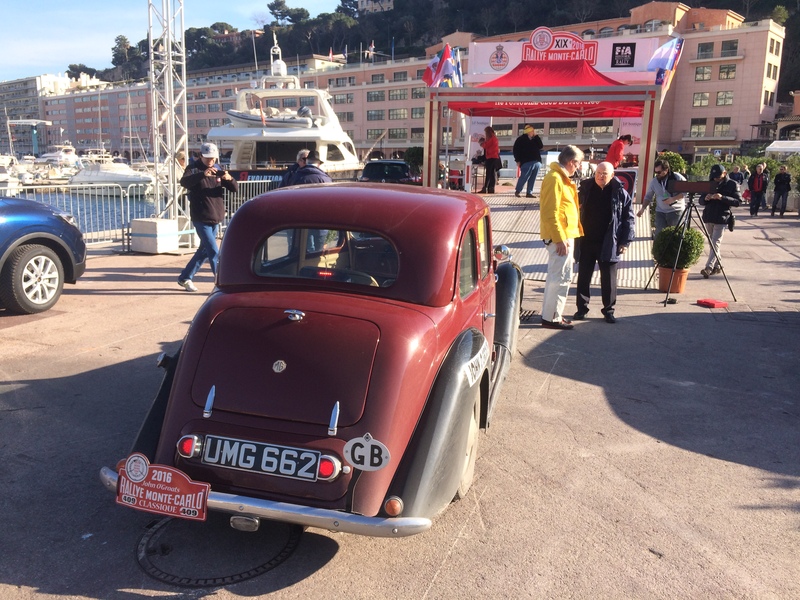 This was the first time that UMG 663 had been classed as a finisher on the Monte having been a non competitive press car in ’53 and having been disqualified in ’54 on arrival in Monaco. 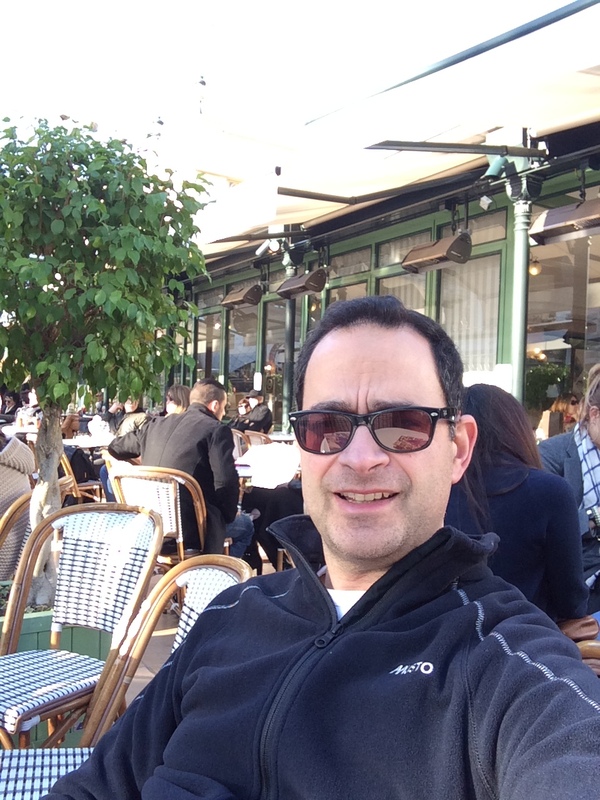 A well earned celebratory drink at the Café De Paris in Casino Square. A £15 bottle of beer never tasted so good! The Classique cars were allowed to park right at the finish on the quayside. 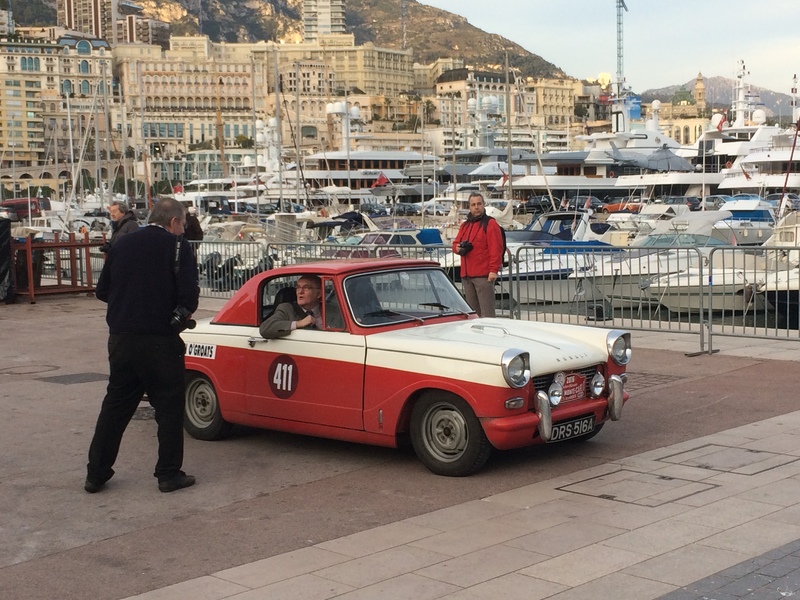 Douglas Anderson, the organiser of the UK Monte start arrives on the quayside in his smart Triumph Herald Coupe. 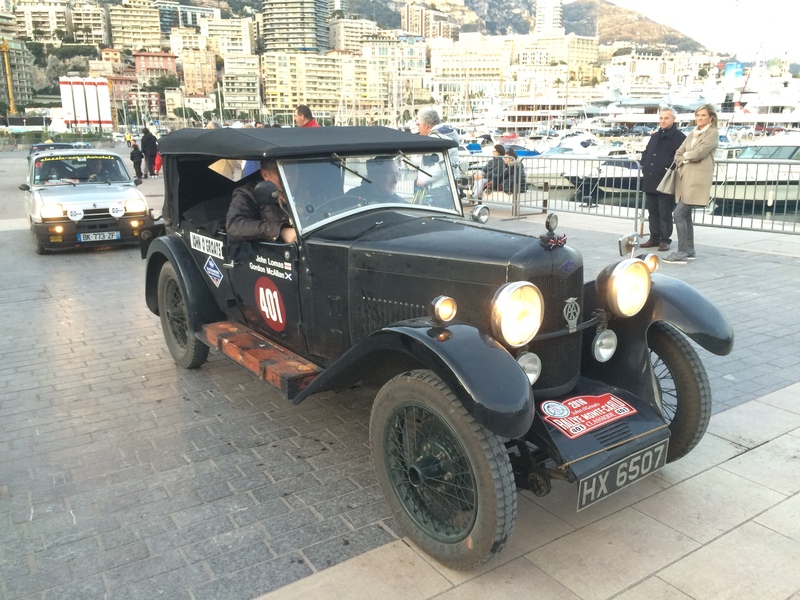 John Lomas’ Riley 9 Tourer arrives at the finish. A tremendous result and a testimony to the quality of the preparation by Lomas’ company, Blue Diamond Services. The sun shines on (as Somerset Maugham so memorably put it) “the sunny place for shady people”! If you look carefully at the quayside above the white marquee you can see the Classique cars parked up. Its always fun driving the Grand Prix circuit at Monaco. 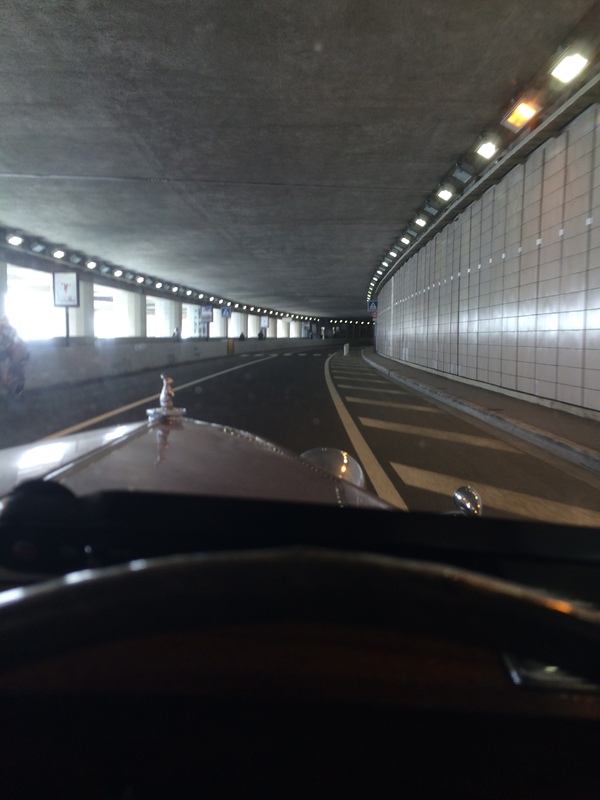 Here UMG 662 speeds through the tunnel towards Tabac, with somewhat less velocity and howl than an F1 car! 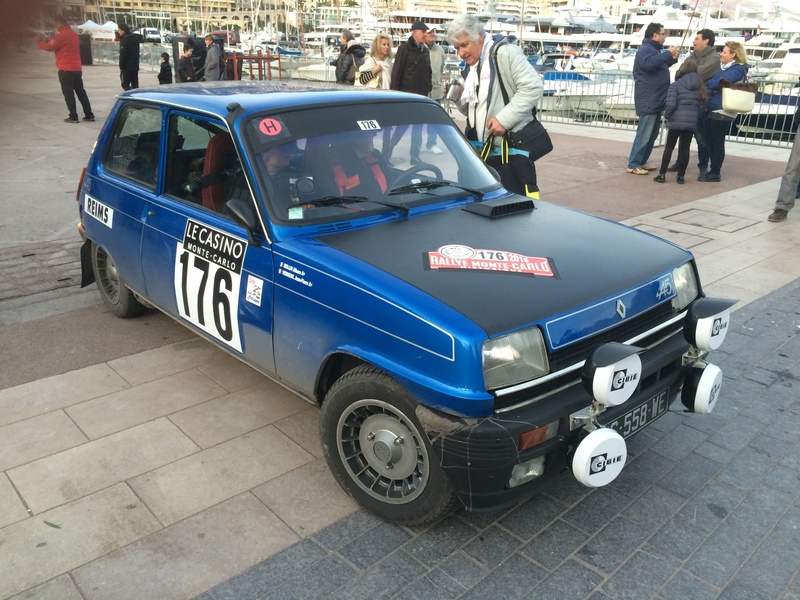 One of several Renault 5 Alpines on the Rallye Monte Carlo Historique, this one the Verneuil / Rollin car that started from Rheims. The Simble / Fjeldstad Saab 96 that started in Oslo. 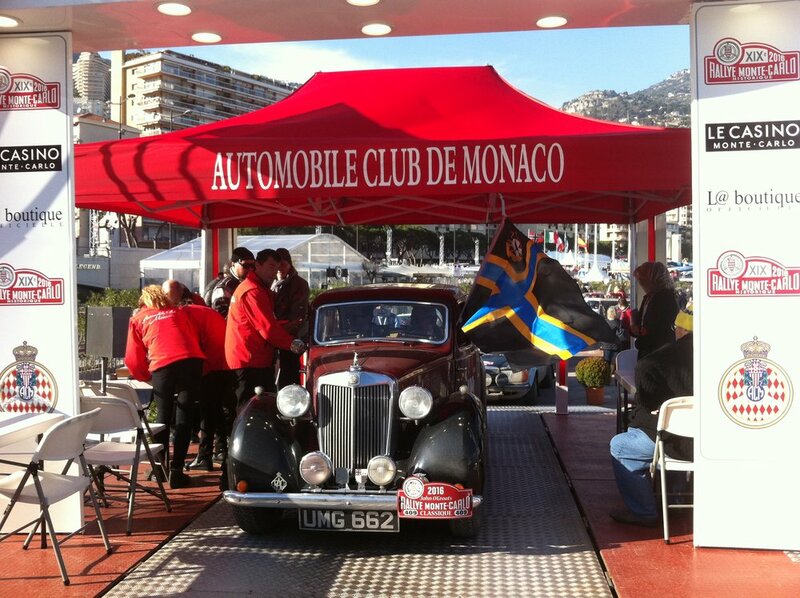 A relatively timeless photo of the Monte Carlo Rally. 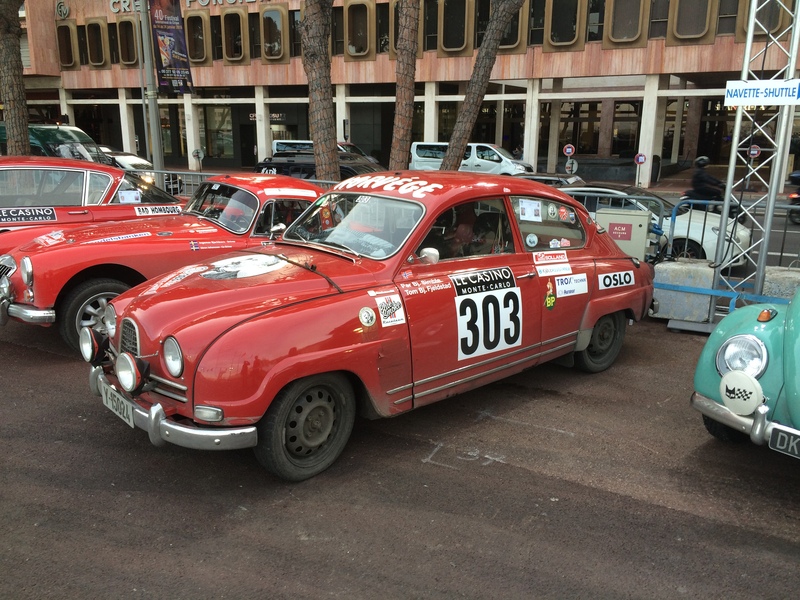 The Priam’s Simca Coupe 1200S climbing up to Casino Square at the start of the Day Two regularities for the Historique cars. The Priam’s started at Rheims. After arriving late in the evening at Calais we were keen to find somewhere to catch a few hours sleep before heading off to Rheims early the next morning. Unfortunately all the hotels near the coast were full and we were lucky to be able to get the last couple of rooms at a motel near Arras. Whilst that meant we did not get much sleep it did mean the drive to Rheims the next morning was relatively quick. On arrival in Rheims we had a little bit of time to spare so stopped at Mumm to pick up some samples of the region’s most popular export! We faced a dilemma. Start cracking on South or follow the Historique cars after their start from Rheims that evening? As there was no penalty in starting immediately we decided to crack on to cover as much of the route south as possible in daylight. The downside was that we left Rheims in front of some rather sparse grandstands! We arrived at the old fortified city of Langres at dusk and met up with a large group of German Historique cars that had arrived shortly before us from Bad Homburg near Frankfurt. Although the Historique caters for cars built after 1955 and before 1981, these German cars illustrate what is needed these days to be competitive on the Historique. Here is UMG 662 heading South on the Monte Carlo Rally in 1953 when she was the Autosport press car. Waiting with her at the level crossing is a British registered Renault 4CV which is actually competing in the rally. This atmospheric photo was taken by George Phillips, Autosport photographer and sometime MG Works Le Mans driver. We left Langres as it got dark. From then on we made great use of our LED headlamps and spot lights as we ran on through the night (and thick fog) past Lyon and Dijon stopping at all the main time controls. Some were harder to find than others. This one (reached at 2am) at Bourgoin – Jallieu was hidden away on a service road on an industrial estate a mile from the town centre. After a brief rest stop in Grenoble we started climbing up into the Alpes Maritime just as dawn was breaking. Whilst there was snow on the mountains the roads were clear. This was something of a relief as we had no snow chains. Funnily enough the weather mirrored that in 1954 when UMG 662 last passed this way. Sunshine and no significant snow! The weather was very different in 1953 as this action shot on the Col Leclercs shows. Much to my surprise UMG 662 had no trouble tacking the mountain passes, mostly in third gear but sometimes in second. The bitter cold (it was -5 c) certainly helped in preventing overheating. Here is UMG 662 at the top of the Croix Haute pass (3,900 feet). A great photo of UMG 662 coming over the Col Leclercs during the 1954 Monte Carlo Rally. No snow at all in ’54! Note the leak hanging from the radiator. A number of the Glasgow starters that year carried this strange mascot although no one is quite sure why! Another period photo of Col Leclercs, this time in 1953. UMG 662 can be seen, as befits a press car, parked up in the background out of the way. The imposing figure on the right watching the Porsche 356 navigating the hairpin is Gregor Grant, founding editor of Autosport and then owner of UMG 662. 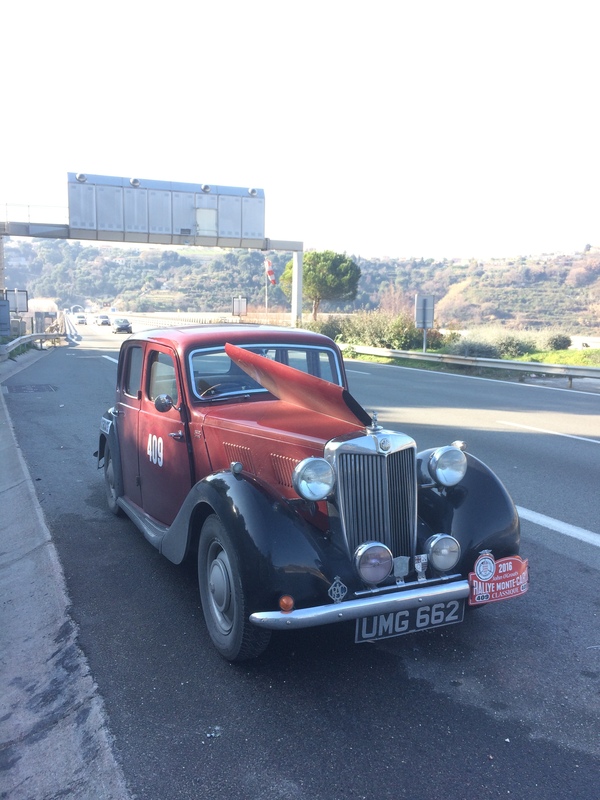 We arrived at Saint Andres-les-Alpes in the late morning by which time we had been caught up by the Historique cars. Its fair to say we caused quite a stir. This camera crew filmed an interview with Per that is included at length in the official ACM TV programme on the Historique and Classique Rallies. The rally fans seemed a bit bored with the endless parade of 911s, Golfs and Opel Kadettes. Anything unusual and / or old attracted lots of attention. We were not the only MG in town. This Swedish crewed MGA started the Historique at Bad Homburg. Another Historique MG, this time the Livingstone / Skelhorn MGB that despite being British crewed also started at Bad Homburg. Busy morning at Saint Andres-les-Alpes! Leaving Saint Andres-les-Alpes for the final stretch into Monaco via Nice.